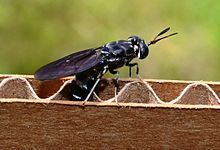 If you have a worm farm and noticed that there are quite large larvae present this is most probably the critter - Black Soldier Fly hermetia illucens. The adult fly, which measures about 16mm has a life span of 5 to 8 days. 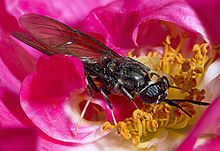 It is very close in size, colour and appearance to some wasps. 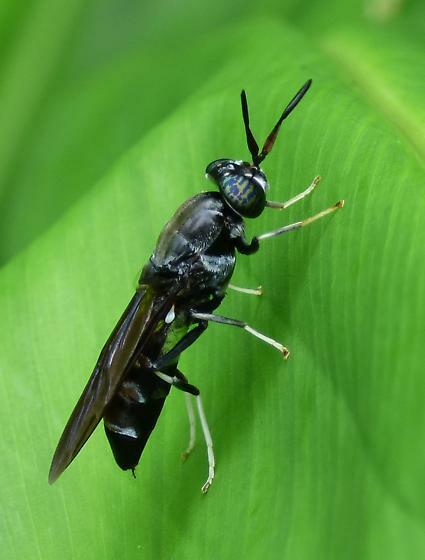 It has an elongated and wasp-like antennae, the fly's hind tarsi are pale, as are wasps' and the fly has two small transparent 'windows' in the basal abdominal segments that make the fly appear to have a narrow 'wasp waist'. The adult soldier fly has no functioning mouth parts and it spends it's entire life searching for mates and reproducing. Because they have no functioning mouth parts and do not eat waste and regurgitate onto human food, bite or sting they cannot be associated with the transmission of disease as the common fly does. Adults mature and mate in the wild. Soldier fly adults congregate in small numbers near a secluded bush or tree in order to find and select a mate. After mating, the female searches for a suitable place to lay her eggs - she produces about 900 eggs in her short life of 5 to 8 days (all without eating!). To optimise their chances of survival, the females prefer to lay their eggs close to the food source rather than in it. About 100 hours later, the larvae hatch then crawl into the waste, which they then begin to consume voraciously. Under ideal conditions, the larvae reach maturity in about two weeks. Amazingly, in the absence of sufficient food, or in cooler weather it may take up to six months for them to grow to the pre-pupae stage. Soldier Fly basically pass through five stages. Upon reaching maturity, pre-pupal larvae are about 25mm long, 6mm in diameter and they weigh about 0.2 grams. 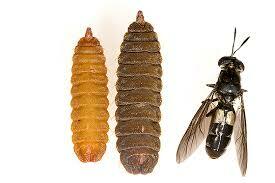 Pre-pupal Soldier Fly empty their gut during their last moult and cannot feed further after that. At this stage, the larva has everything that it needs to sustain itself as it changes from pupae to adult fly. The Soldier Fly has attracted the attention of researchers because of their capacity to consume large quantities of organic waste including fruit, vegetable residues, offal, pig and poultry manures into high quality animal protein that can then be fed directly to chickens and fish. So voracious are the larvae and such are their numbers, that they can sometimes displace worms in worm farms. If you are concerned that this is happening in your worm farm place thick layers of wet newspaper over the top of your farm or use a commercial worm farm blanket, along with the application of a worm farm conditioner or alternatively add some agricultural grade lime. The larvae are very rich in protein, therefore an excellent food source for our chickens and ducks. 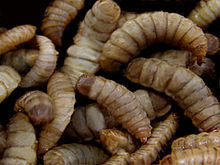 Some researchers suggest that Soldier Fly larvae are the nutritional equivalent of fishmeal and a good replacement for it. It has to be said though, that the biggest issue with these little critters is their rather negative image - let's face it, they are not the prettiest sight in the world and we have to 'gird our loins' to handle them - the mere thought of handling larvae fills most people with revulsion. They are dry to the touch and have absolutely no odour, so are not unpleasant to handle. In fact the pet industry has overcome the image issue by marketing Soldier Fly larvae, as live food to owners of fish, birds, frogs and reptiles under the more innocuous name of Phoenix Worms. As the larva of the Soldier Fly can be used to convert large quantities of organic wastes into a high quality animal protein that can then be fed directly to chooks etc there are more and more people encouraging them to breed up for that express purpose. If you are interested in farming Soldier Fly larvae a link here discusses how to achieve it. Soldier Fly larvae are famous for their ability to climb a 45 degree ramp so make the harvesting process quite simple. The larvae will crawl out of their food source and make their way to a collection point having effectively sorted themselves by size (only those ready to pupate will make this journey) and having cleaned themselves on the way. These are very interesting critters, and yes I have noticed them more during the warmer months in my worm farm.